It has been three years now since dad passed away and the mergansers are back each year. Dad was in a losing the battle with an unforgiving and relentless disease, Alzheimer’s. Simply put, Alzheimer’s is an hour glass of life’s memories forever sifting and slipping away. There was a small sign with my father’s name, outside his 10 x 12 room, but when reality sunk in, dad just wasn’t home. There were many occasions thereafter, I realized just how much I missed him. Dad was a conservationist. He loved the outdoors and natural surroundings. He took great pride in building and placing wood duck and blue bird houses all along the river in Wisconsin, on which he and my mom lived. For that reason, I was excited to see wood ducks on a pond behind my office. Keep in mind I live in Florida, not Wisconsin. I was so excited, I called mom and she sent me wood duck houses for the pond. I mounted them on some beautiful cypress trees on the pond. It turns out the “wood ducks” didn’t want anything to do with their new homes. 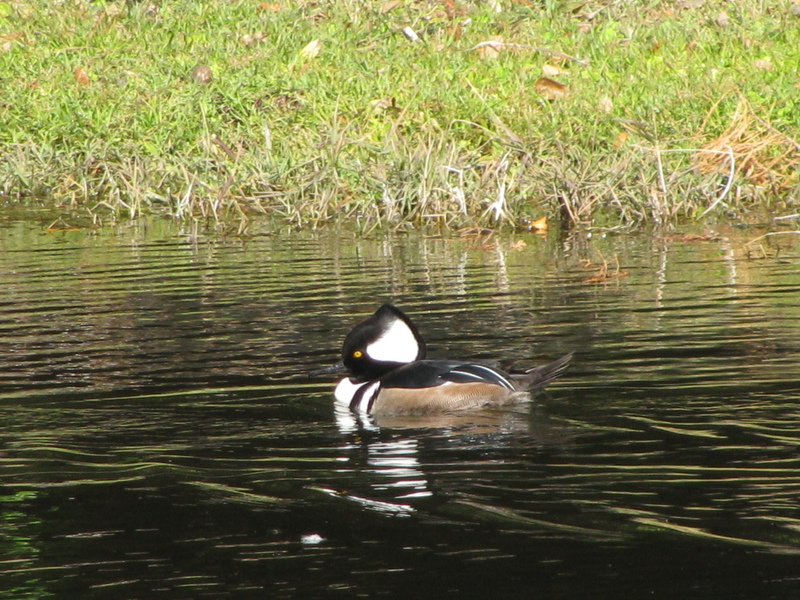 In fact, they weren’t wood ducks at all, they were Hooded Mergansers! Of course dad would have known they were mergansers. He would have laughed and told me mergansers are migratory. They were just passing through, just like dad.